Steps from white sandy beach. designed to draw you outside towards the sun, water, ocean breeze and comfortable vacation lifestyle. 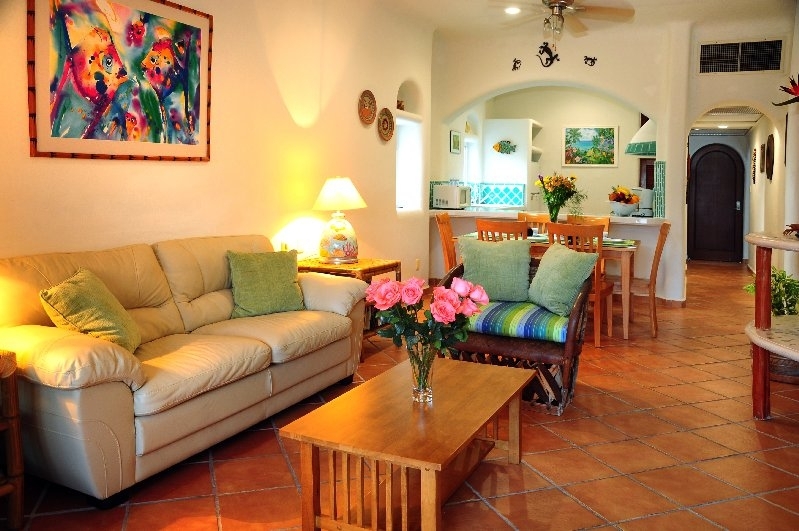 Casa Cocatino has all the things you expect to find High Speed Internet Optic Fiber in a condo vacation rental in Playa del Carmen and is perfect for parties of up to 4 people. This spacious third floor penthouse with two bedrooms and two baths invites you to relax in a serene environment. Enjoy your private terrace surrounded by the tropical greenery, in the mornings, as you sit on the balcony drinking your coffee, you will thrill to the sight and sound of the flocks of birds that fly over the swimming pool on their morning rounds as they look for the perfect tree in which to perch and enjoy the sun. The fully equipped kitchen has all modern conveniences for your to prepare a gourmet or a simple meal. The living room has an entertainment center complete with a flat screen TV and WIFI. Sliding glass doors off the living room leads to your private covered terrace. The master bedroom has a king-size bed, ensuite bath with shower and walk out slidding glass doors to terrace. Guest bedroom has a two single beds. Guest full with shower located in hall area and houses the washer and dryer. Walk through a lush tropical garden and find yourself at the swimming pool that offers a relaxing setting and a perfect spot to take the midday sun all surrounded by swaying tall palm trees. Calmness, serenity and privacy are just a few of the elements that define this exclusive location. Natz Ti Ha integrate modern, functional design with a traditional Mexican look. Spacious common and lush green areas are a hallmark of Natz Ti Ha condominiums. This condominium building has gated parking, 24 hour security personnel. 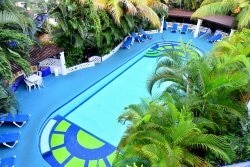 All you have to do is bring your smile and a swimsuit to have a great time while staying in beautiful Casa Cocatino. Check In Information: Check in 3.P.M. Check out 10:00 A.M. Please plan to arrive at your vacation home no earlier than 3pm. Please do not enter the premises before this time. For arrival on or after the above times, please go directly to your vacation home. The lock code, for the front door of your condo will be sent a week prior to arrival.